One of the most breathtaking and longest hiking routes in Europe, the Samaria Gorge tops the list of must see things in Crete. 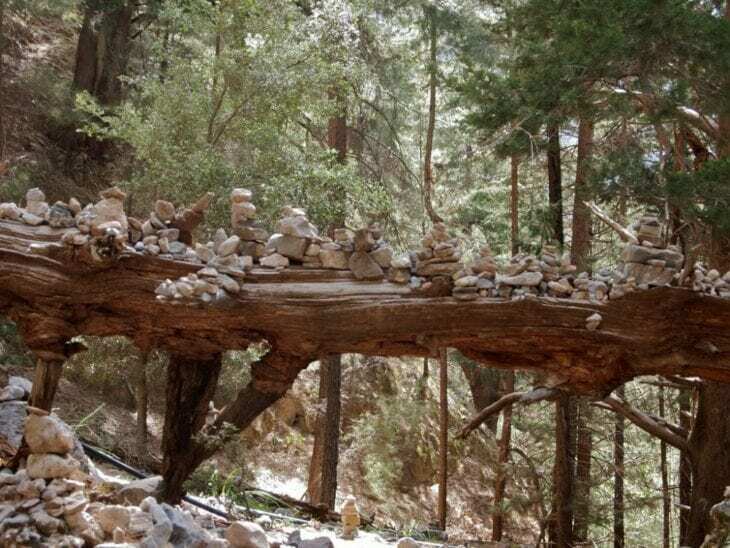 An important natural landmark of Crete, over the years the Samaria Gorge has played a crucial role in both the Cretan and Mediterranean history. Often referred to as the land of gorges, Crete’s natural landscape is dotted by over 400 canyons and is home to the largest number of gorges in Greece — Samaria Gorge being the crown jewel of all. 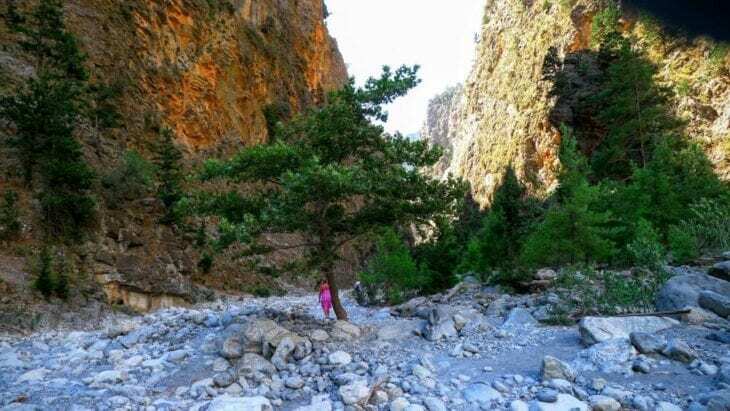 Here’s everything you need to know about Samaria Gorge in Crete. At 1,200 m above sea level the Gorge of Samaria located in the prefecture of Chania, lures visitors to experience its landscape of exceptional geological value and beauty. Situated in the heart of Crete’s only national park — the National Park of the White Mountains of Crete (Lefka Ori) also known as the Samaria National Park. 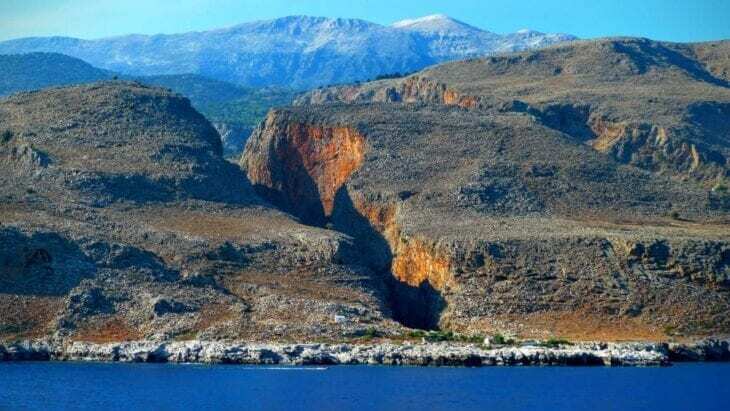 The White Mountains cover 7% of Crete’s total surface, adorned with over 50 mountain peaks some of which exceed 2,000 meters in altitude — the highest, Pachnes, reaches a height of 2,453 meters overlooking the Libyan Sea. It is here, completely isolated from human presence — ecosystems evolve without interruption. Providing shelter to dozens of endemic species and subspecies, the Samaria National Park is home to the famous Cretan Agrimi Goat, the Golden Eagle and the Cretan Wildcat — just to name a few. Over the years, Samaria’s secluded and strategic location has played a crucial role as a refuge place from the oppression of foreign invaders. Although the area has been mostly isolated, traces of ancient settlements have been discovered near to the chapel of Agios Nikolaos indicating a possibility of the Sanctuary and Oracle of Apollo being located somewhere in close vicinity. 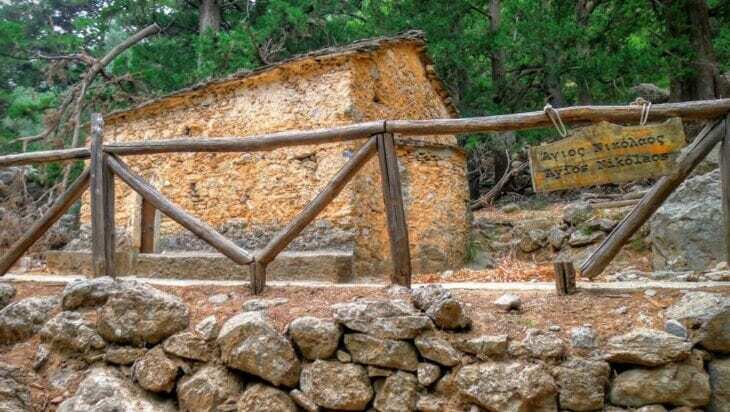 The desolated village of Samaria set in the heart of the Samaria Gorge at 8.5 km from Agia Roumeli (ancient city of Tarra) was abandoned by its last inhabitants in 1962 when the area received a designated title of a National Park. Writings of Homer document that Tarra where the modern site of Agia Roumeli is found today was one of the 100 cities of Crete — with its own coins and a prominent wood exporting industry, the city had close ties with ancient Egypt, Mycenae, Knossos and Troy — supplying wood for the construction of palaces and ships. 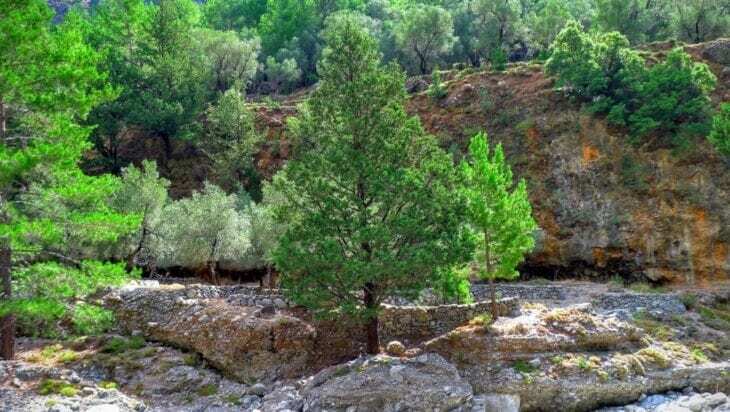 Major events in Cretan history took place in the vicinity of the Samaria gorge. Under the Venetian ruling during the 14th century, members of the Skordilis family from Hora Sfakion moved to the village of Samaria. The story has it that the commander of the Venetian ruling had his eyes set for the charming Chryssomaloussa who had resisted his kiss — he in return chopped off one of her locks with his sword. Due to this incident a battle resulted between the two parties — with the Skordilis family escaping to the secluded village of Samaria. The Venetians failed to enter the village and as a result they had to make peace. The beautiful Chryssomaloussa became a nun in the convent of the Blessed Mary of Egypt (Ossia Maria). A church dedicated to Ossia Maria was constructed here by the Venetians in 1379. Maria was known as the Mary of Egypt — she was an Egyptian courtesan who mostly lived in the desert. The Saint Mary of Egypt is celebrated in this church on 1st of April, however the Orthodox church also commemorates the saint on the Fifth Sunday of Lent. For those who do find themselves here on the first weekend of April can participate in a two day festival which is held here in her honour. The Gorge of Samaria was the scene of numerous battles which took place here between the Greeks and the Turks. During an uprising of 1770 led by Daskalogiannis of Anopolis, 4000 women and children took refuge is the gorge. In 1896 all of Greece had fallen under the rule of the Ottoman Empire except for the Samaria Gorge. During World War II it served as a major escape route for the retreating Allied troops. The Samaria Gorge is a major tourist attraction in Crete, second most popular after the Palace of Knossos. Europe’s longest gorge with a length of 18 kilometres, leads all the way to the coastal town of Agia Roumeli set on the stunning shores of the Mediterranean Sea. 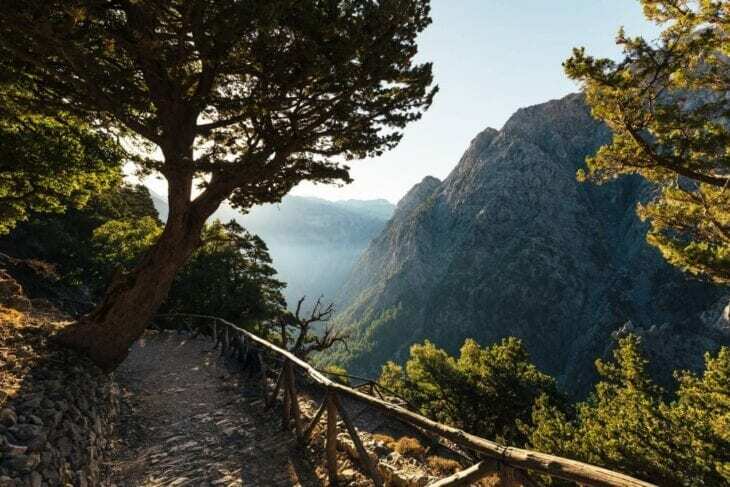 Samaria Gorge is a paradise for biodiversity — home to 450 species of Cretan flora out of which 70 are endemic meaning that they grown only in a gorge. Hiking in Samaria Gorge is a rewarding experience which can last somewhere between 6-8 hours depending on the pace. The hike commences at Xyloskalo the famous location of the Omalos plateau (1.250 m above sea level) where there are several local taverns, hotels and a museum dedicated to the Samaria Gorge. The Gorge of Samaria is open to the public from May to October. Entrance fee €5. The hike will take you through some of the most remarkable scenery, where you will cross a few wooden bridges, encounter lazy Cretan wild goats (Kri-kri) basking under the summer sun, cross several narrow passages — the most famous being the Portes or Iron Gates, which is 3 m wide and 300 to 700 m high from both sides. Along the way you will also admire the fragrant forest of pine and cypress trees, surrounded with unique flora and the renowned Cretan herbs. Following the gently slopping downhill trails you will eventually reach your desired destination — the small coastal town of Agia Roumeli which is only accessible on foot or by a boat. Here you can enjoy a rewarding swim in the Libyan Sea or a delightful lunch at a local taverna. The Church of St. Nicholas — set on the lowest point of the of the hiking route, the stone church of St. Nicholas is built on the ruins of an ancient temple. Samaria Village — this is the main stopping point of your hike, situated in the middle of the gorge. The main occupation of the inhabitants living here before the village was closed in 1962 was wood cutting and bee keeping. You can still find traces of previous life here as some of the old houses have been restored to house modern facilities such as the doctors office and guard point. The old olive mill is now used as an information desk where visitors can admire old pictures and folk art exhibits. Portes or Iron Gates — the final point of you hike is the narrowest point of the gorge where steep cliffs soar 500 meters above sea level. Along the route you can also admire the Venetian castles and ruins, evidence from the prehistoric settlements. Getting here early in the morning is highly recommended to beat the crowds. We recommend staying in Chania — if you are planning on making the trip to the Samaria Gorge the easiest way is to either take a guided tour or use the public transportation. Driving here with your own rental car is only feasible unless you plan to hike back (which is impossible — since the route down takes 6-8 hours and the same applies to going back) or take a ferry to Sougia from where you will need to take the bus back to Omalos. Check the ferry schedule before opting for this option. If you do decide to take the bus, it is recommended to take the earliest one that will take you from Chania to Xyloskalo. Once you complete the hike of the Samaria Gorge and end up in Agia Roumeli you will then take the boat. The boat usually comes here three to six times a day, depending on the season. The last one usually leaves around 6pm. During the winter months the timetable is limited however daily service commences at the beginning of April. For information about the ferry boats ANENDYK LINES click here. The trip to Chora Sfakion lasts an hour and passes through the picturesque village of Loutro — one of the most picturesque villages on Crete. From Chora Sfakion you can take the bus back to Chania. If you want to explore further, you can also visit Paleochora which lies west of Agia Roumeli and has a bus connection to Chania. Make sure to wear hiking boots or comfortable trainers, not flip flops. Swimwear and towel if you plan on enjoying a refreshing swim at the beach of Agia Roumeli. Have you been to the Samaria Gorge — how was your experience? 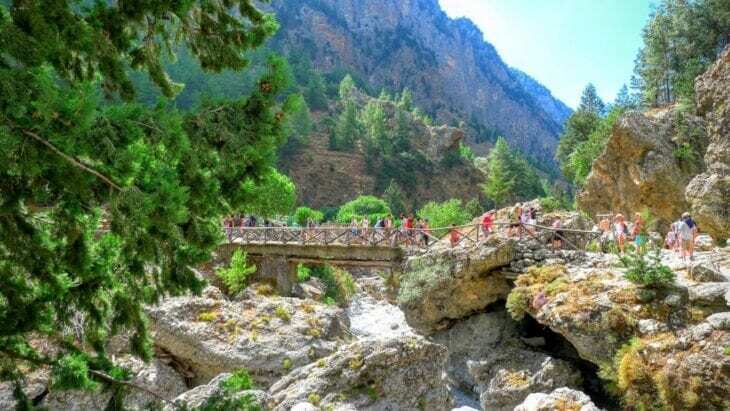 If not we hope that our guide to Everything You Need To Know about Samaria Gorge will be useful in planning your trip. 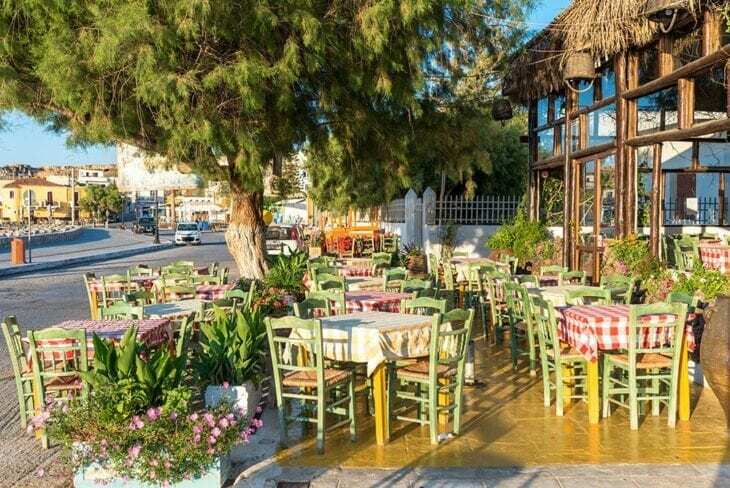 This entry was posted in Authentic Crete Travel, Chania, Crete Attractions & Tips on October 8, 2018 .